In 1910 Donald Matheson, the general manager of the Caledonian Railway, spent a pleasant holiday in Strathearn. So taken with the place was he, that he decided to build a luxury hotel in the area. James Miller, who was also responsible for the Turnberry Hotel, was appointed architect and work on the building began in 1913. The hotel was due to open at Easter 1915 but progress was halted by the First World War and it was not until 1924 that the hotel opened its doors. The advertisement is from National Geographic in 1925: even then it was firmly focussed on the North American market. 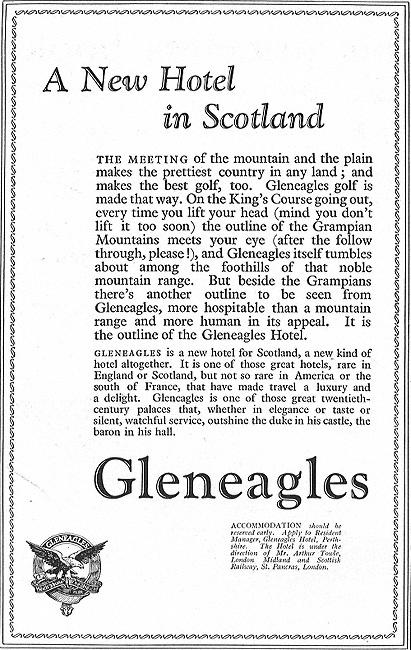 For all the opulence with which Gleneagles is now associated, it is interesting to note that for the first ten years or so of the hotel's existence, the Haldane family, who owned the nearby Gleneagles estate, fought a vain battle to ensure that the hotel management always referred to their establishment by its full title of the Gleneagles Hotel. After all, they did not wish their estate confused with something as downmarket as a 'modern railway hotel'. Development of the golf course was speedier. James Braid and Major C K Hutchison visited the area in December 1913 and, the following April, were appointed to design and supervise the course construction for a fee of &pound;120 plus expenses. The work was done by Carters the seed merchants at a cost of &pound;5500. The King's Course and the Queen's, intended as a ladies' course, were completed by the end of the War. The King's opened officially in May 1919 and the first professional tournament was played there in 1920 and won by the pro at Turnberry, Tom Fernie. The map of the course is from 1921. In the same book he discusses the Ryder Cup but does not mention Gleneagles' role in that competition. He mentions the informal match between Great Britain and the United States at Wentworth in 1926 (which GB won by 13½-1½) but a similarly one-sided match took place at Gleneagles on 6 June 1921. The course's designer, James Braid, beat Clarence Hackney 5 & 4 in he singles and, playing with J H Taylor, halved against Hackney and the US Open Champion of 1908, Fred McLeod. The final score was 9-3 in the home team's favour. This international was a preamble to the main event, the Thousand Guineas Golf Tournament, which featured twelve players from Scotland and England, twelve from the USA and Arnaud Massy. If you wonder what sort of eagles you will see in the glen unless they are on your scorecard you will be disappointed. Contrary to the logo used by the hotel the derivation of the name is an anglicisation of Gaelic glen eaglais, the glen of the church.